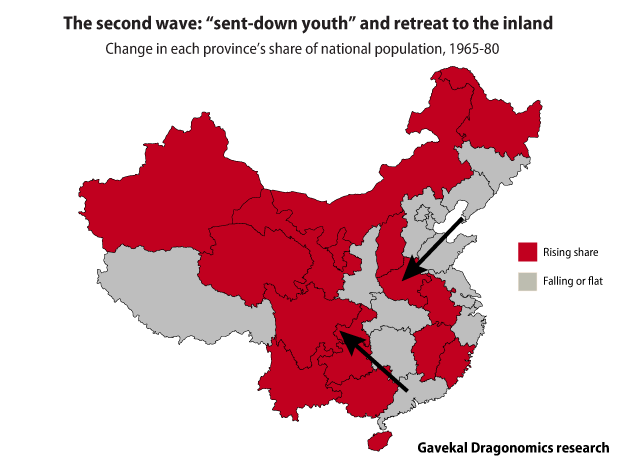 One of my recent side interests has been getting an understanding of how China’s population flows in recent decades relate to patterns further back in history. Mass migration has been a feature of Chinese history long before recent years’ headlines about migrant workers and urbanization. One example is the huge movement of people into Manchuria in the late 19th and early 20th century, which was in terms of the absolute number of people comparable to movement of people into the western United States from 1880-1950, and larger than the emigration from Ireland in the 19th century (according to statistics from Thomas Gottschang’s 1987 article; JSTOR link). After the founding of the People’s Republic in 1949, central planning and political campaigns also had big effects on the movement of people. Examples here are the heavy-industrialization drive of the 1950s, or the “sent-down youth” phenomenon of the 1960s, when millions of students were shipped from urban centers to more isolated provinces. Hopefully the maps should mostly speak for themselves, but the shift in the direction of population flows over time is quite striking. 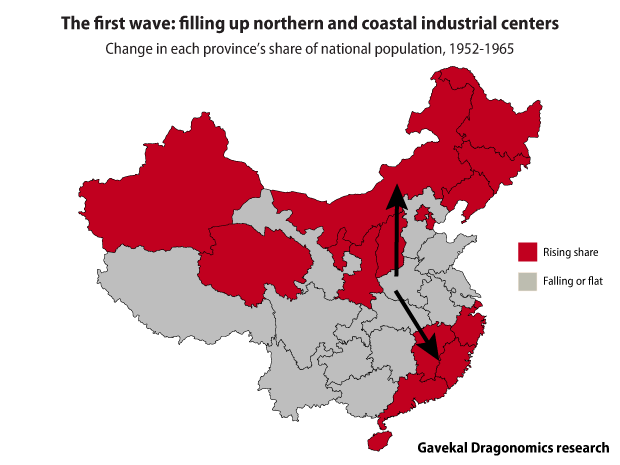 The first years of Communist rule led to big flows of people into old and new industrial centers in north China and the Pearl and Yangtze River deltas. Some of those movements were then reversed in the chaos of the 1960s, which saw the coastal provinces lose people to a belt of inland provinces. With the reform era the influence of political campaigns declined, and the market forces helped draw people to growing urban centers where higher wages could be earned. 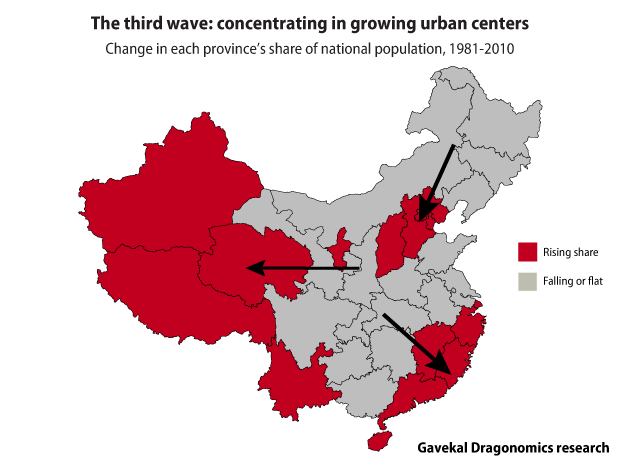 The formation of big urban concentrations around Beijing, Shanghai and Guangzhou/Shenzhen is clearly visible in the map. Some regional patterns persist throughout the three periods, notably the net migration into Xinjiang and other western provinces, as well as the island of Hainan, which were places that were relatively lightly populated. I’m sure there is more to learn here, but I have to say these initial results are quite pleasing. Next Post → Does this plan for tackling China’s excess capacity have a chance?